Seamless & stress-free airport transportation has never been easier. 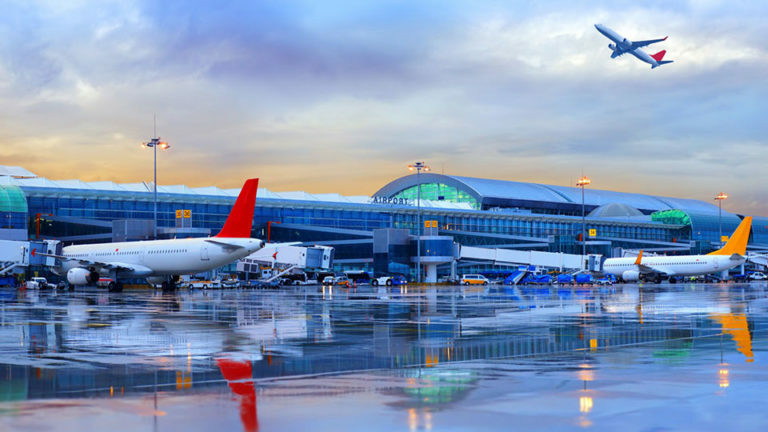 Our chauffeurs remove the stress from airport transportation by meeting you at one of three airport areas most convenient for you, while providing a safe and reliable ride to your destination. Wherever you need to travel, we’ll get you there feeling relaxed and on-time. Our chauffeurs are trained to provide you with the most reliable and convenient transportation experience in the LA area. Forget long waits at the airport for transportation to arrive. Let us get you where you need to go quickly, safely, and in style. We offer three premium vehicle options in order to comfortably accommodate parties of most sizes: choose from a luxury sedan, an SUV, or a sprinter van depending on your needs. We also provide a variety of extras to make your ride the best it can possibly be. Need to stop somewhere on the way? Not a problem. Would you prefer your chauffeur to meet you inside the airport to help you collect your luggage? We’ve got you covered. No matter what your needs are, we will meet and exceed them. Download our app to conveniently track your driver, book, and schedule rides all in real-time. Ensure that your phone is on and charged so that your chauffer can contact you once they arrive. In case you need to cancel, please let us know at least 2 hours prior to your pickup. See our FAQ section for more information and full details on cancellations. Our chauffeur will track your flight, and within 5 minutes of landing, they’ll send you a text message to connect with you. Your vehicle will remain parked in the holding lot during this time. When you have your luggage and you are ready for pick up, please text or call your chauffeur the number and letter of the column you are near outside of baggage claim. All pickups are required to be performed on the ground level. Please note, under normal conditions, it will take about 10 minutes for your chauffeur to reach you. Unfortunately, LAX has been extremely busy, under construction, and very congested. Our chauffeur will track your flight, and within 5 minutes of landing, they’ll send you a text message to connect with you. Your driver will be parked and waiting in the parking structure nearest your arrival terminal and communicate with you the exact location. After you collect your luggage, cross the street to the parking structure where your chauffeur will meet you. Once you are met it is short walk to the vehicle. We do not recommend this type of pick-up if you have multiple pieces of luggage, have young children, or have a traveler that will have difficulty walking over to the structure. Your chauffeur will track your flight, park in the parking structure nearest your terminal, and walk into the terminal. They will exhibit a name sign and wait close to where you exit the security area, which is right before the baggage claim area. Your chauffeur will assist with collecting your luggage and then proceed with you out to the parking structure to enter the vehicle. We highly recommend that you do NOT schedule one vehicle to pick up passengers from different flights. Although the flights may be scheduled to land at the same or close time, most times one or both flights will be early or late. We are required to purchase a trip ticket for each flight and we cannot enter the airport until the last flight is ready for pick-up. Often times this results in clients waiting long periods in the terminal for the additional flights to arrive. Complementary forward-facing car seats, rear facing infant seats and booster seats are available.